It never fails, come mid-August it dawns on me that berry season is quickly coming to an end and I start franticly cooking every kind of berry laced treat I can think of. 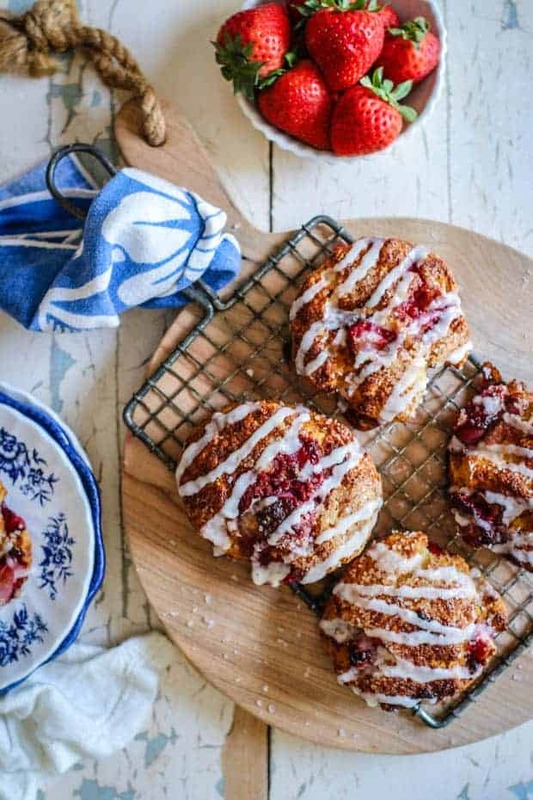 The recipe for these Gluten Free Strawberry and Cream Scones are the result of a recent berry-crazed baking binge. These gorgeous strawberry studded scones are surprisingly simple to make — and irresistible, especially hot from the oven! If you’ve never had a proper scone before I assure you my friend that you are sadly missing out! I’m not talking about the rock hard, crumbly scones that they sell at the coffee shop. I’m talking about a legit scone! Real deal scones fall somewhere between a biscuit and muffin in texture. They have a delicate crusty exterior, and are tender, with a light crumb within. They’re the ideal baked good for breakfast on the go and they are the perfect gift to take to a friend who could use a little cheering up. Let’s talk about the combination of gluten free flours in these scones for a minute shall we? There was a point in time when I stored what seemed like TONS of different types of gluten free flours in my pantry. These days I have a few trusted favorites that I always keep stocked and use over and over again when my all-purpose gluten free flour just won’t cut it. These scones are made up of a blend of superfine brown rice, sweet white rice, tapioca starch/flour, cornstarch, and potato starch.While I realize that 5 types of flours may still seem like a lot to some people I assure you, it is totally worth the added effort and time spent because the texture and taste you get in these scones is far superior to any other gluten free scone recipe I’ve ever tasted. I use this same blend of flours not only in these scones, but I also use them to make my family’s favorite homemade gluten free biscuits and the best gluten free naan bread you’ve ever had! Enough about flour, back to those scones….. I baked these Gluten Free Strawberry and Cream Scones over the weekend and packed them up for our car ride to little league tryouts. 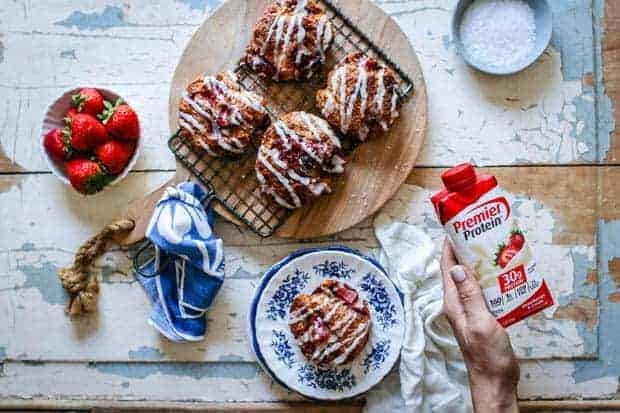 I knew Kash would need a healthy snack that would stick with him the entire afternoon so I decided to substitute the buttermilk in my trusty scone recipe for Premier Protein’s Strawberries & Cream Protein Shake. 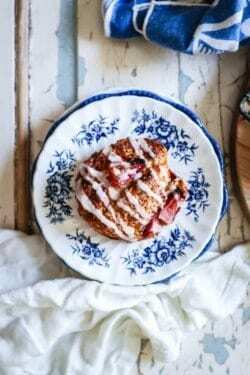 These luscious strawberry filled scones were a huge hit with our little crew – the kid’s gobbled their’s up, Todd and I each went back for a second helping, and no one had any clue that their pastries were protein packed! I see these babies being on repeat around here until Summer quits offering up gorgeous berries. 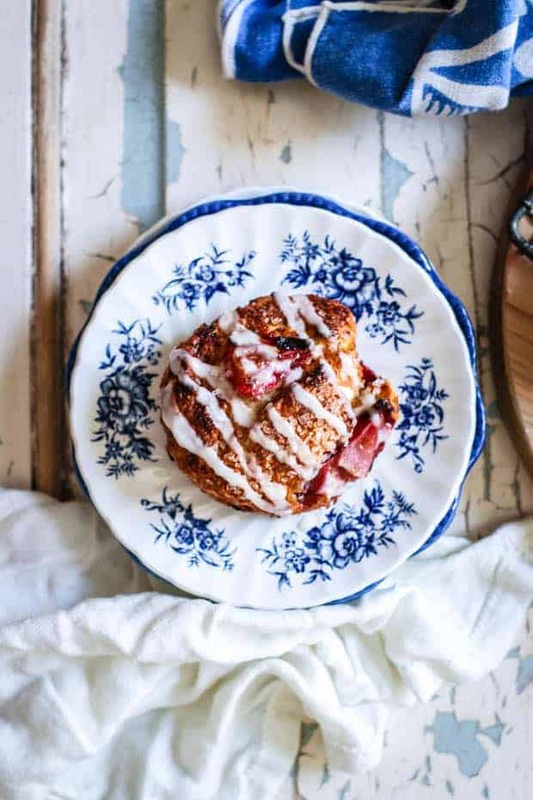 If you’ve made these Gluten Free Strawberry and Cream Scones or any of the other recipes on our site, don’t forget to rate the recipe and let me know what you thought in the comments below, I love hearing from you! You can also FOLLOW ME on FACEBOOK, INSTAGRAM, TWITTER, and PINTEREST to see more delicious food, design, and decor. 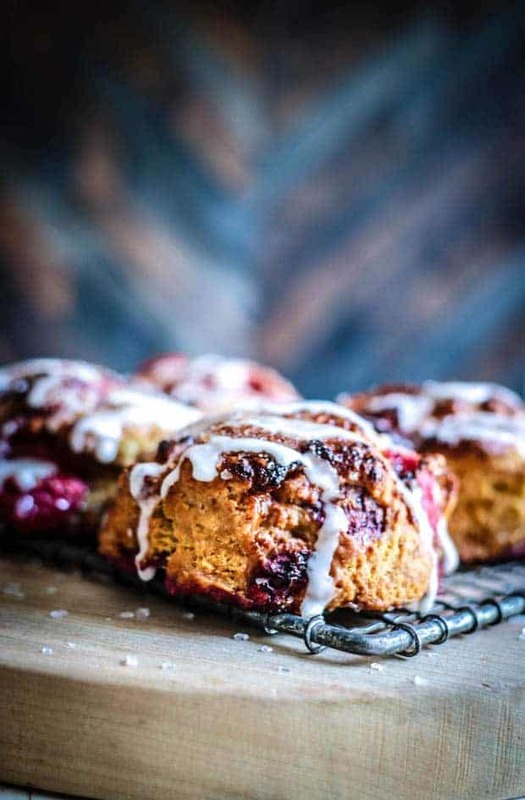 These Gluten Free Strawberry and Cream Scones are perfect fresh from the oven or even at room temperature the day you bake them. If you plan to store them overnight we suggest you seal them in an airtight container and toast them right before you want to serve them. 1 cup Premier Protein’s Strawberry and Cream Protein Shake, plus more for brushing on the tops of the scones. Place the sliced berries in a small bowl and sprinkle with 1 teaspoon of granulated sugar, toss to coat. In a food processor combine the brown rice flour, sweet white rice flour, tapioca flour, cornstarch, potato starch, xanthan gum, baking powder, baking soda, sugar, salt, and pepper. Pulse until combined. Add the cold butter pieces into the food processor and pulse until incorporated and the mixture resembles coarse crumbs. Transfer the butter/flour mixture to a mixing bowl. Add the buttermilk to the mixing bowl and gently mix until the dough begins to come together. Don’t over mix. Fold the strawberries into the dough. The dough will be very sticky. Lay 2 large pieces of plastic wrap over your kitchen counter, overlapping slightly, and turn the dough out on top of them. Fold the edges of the plastic wrap over the dough to cover it then use your hands to mold the dough into a circle that is approximately 1 1/2 -2 inches high. Use a lightly floured 2 1/2 inch round cutter to cut the scones into rounds. Transfer the scones to a baking sheet pacing them apart by 1-inch. Use a pastry brush to lightly brush the top of the scones with Premier Protein’s Strawberry and Cream Protein Shake. Sprinkle the top of the scone with sparkling sugar is using. Bake in the preheated oven for 12-14 minutes or until golden and cooked through. Transfer to a wire rack to cool slightly then serve immediately with butter or let cool completely to drizzle with icing. In a mixing bowl combine the powdered sugar and the Premier Protein’s Strawberry and Cream Protein Shake. Beat together with a whisk until completely combined. Drizzle over cooled scones.